Dialogue may be considered to be a session of give-and-take that occurs with relatively short turnaround time — one person speaks, then the other person responds, leading to the first responding to the second’s responses, and so forth. The time lag between the first person speaking and then speaking again is the consideration for the length of time the second person speaks. Such an exchange occurs from between two people and becomes decidedly more complex as the number of participants is added, as in a focus group setting. When we talk about dialogue in terms of the relationship between the media audience/user and the media industry, we are talking about how the one speaks to the other, and the other listens and responds. The dialogue can result in the opinions of the audience/user influencing the content of the media texts because the industry has incorporated the opinions of the audience/user. The relationship between the media audience/user and the media industry in the United States has always been one of capitalist interests. Since nickelodeons and RCA, dialogue between the producer and the consumer has been based on a supply/demand model of product consumption. The audience/user historically had little say over production of a media text except through the power of their purchasing dollar — what they did not like was not repeated. Not until the past few decades was the potential audience/user solicited for their input before the final marketing and release of the product, be it an album, a movie or a television show. In order to “ensure” a successful product release, media companies will pre-screen their product and use any feedback to adjust the product before it is mass distributed, hoping that the pre-screening process will detect any flaws that may prevent the product from not only recouping production costs but generating substantial profits. Historically, then, there has always been a time lag in the give-and-take between the audience/user and the industry. There’s the historical, and still present, time-lag, where Hollywood gives us something, and we indicate how much we’ll take it by how much money we’ll spend on it — thereby, the audience gives Hollywood their opinion on the product, which Hollywood takes to use to create their next product. Even with the use of focus groups, we see this same type of exchange. Even with the opinions provided in focus groups, there is still a time-lag between seeing the effects of such opinions due to production time. This time-lag has been diminishing around certain texts. Reality shows like American Idol rely on audience/user feedback to influence the progress of the content. And in the case of American Idol, the dialogue has a time-lag of only 24 hours. There are those who would like to further reduce this time-lag, of having instantaneous dialogue between the audience/user and the industry. Such interactivity is one of the draws for computer and video games, but the vast majority of such games still have a preset content — they may allow the player to choose to go down this or that path, but the path and what’s at the end of it is still determined by the game designers. There are MMORPGs that offer far more freedom for the player to determine the content. These proponents, then, who wish to reduce the time-lag in dialogue are essentially asking for the other media — chiefly film, television — to become just as interactive as the games. The question is, is such a dialogue truly desired by either party when the media in question are films and television. To what extent is the media industry willing to relinquish creative and potentially financial control over the content? And how willing is the media audience/user to take it such control? As media users, we come to associate certain gratifications with certain media technologies because of our interactions with the content put forth by that technology. We have come to expect a certain type of interaction with film/television content, and this interaction is different than the one we have come to expect with computer/video games. Do we really want these different interactions to cross? For film/television, we get to lean back and be the spectator, while with games we have to lean forward and be the player. As comic scholar Scott McCloud points out, the line between the “lean back” and “lean foward” is not a straight line but a curve — you either roll one way or the other based on the media/content you are engaging with. Expecting this dialogue or interactivity to be the saving grace for how the media audience/user engages with the media/content, and by extension the media industry, appears more to force the audience/user into a position they may not be willing to take up. Instead, the dialogue should focus on fostering respect between the two based on mutual understanding of the importance, position and interests each party has in the continuance of the relationship. This comes down to the media industry respecting the media audience/user’s interests, resources and intelligence when they design media/content, as well as the audience/user respecting the industry’s capitalist driven needs when they consume the product. 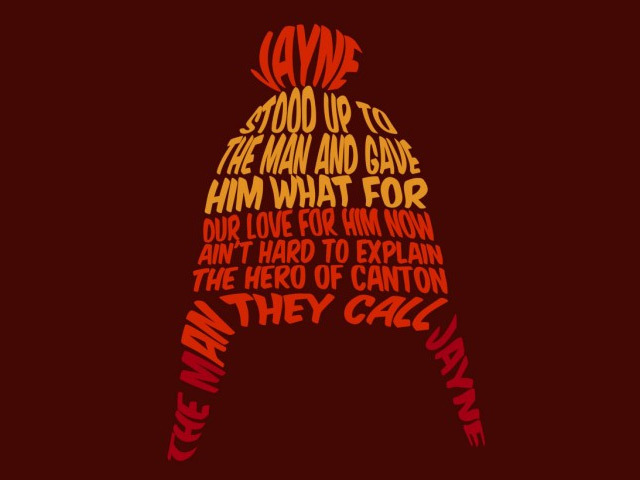 As an example of how this does not work: the furor over Jayne hats. Audiences/users should respect copyright when that copyright is apparent, necessary and non-abusive. The media industry should respect audience/users passion, creativity and activity when it does wholly infringe on their ability to capitalize on their productions in order to further said or similar productions. This is the type of respectful dialogue that we need — no abuse of fandom on either side.